HistoricChurchturnstoNewTechnology - Summit Utilities Inc.
Christ Church in Gardiner is the oldest continuously operating Episcopal Church in Maine. For more than 200 years it has played a vital role in the community as a place for people to share their faith, host nonprofit events, raisemoney for community organizations and so much more. This year, the church is turning to new technology and Summit Natural Gas of Maine to help fuel their community efforts for another 200 years. Since the beginning, the historic church has hosted thousands of church services, baptisms, funerals and weddings while also opening their doors as a meeting place for local nonprofits and community groups ranging from Boys and Girl Scout troops to training programs for service dogs. In recent years, the church has experienced economic challenges with escalating energy and maintenance costs. As a result, members of the church have been unable to fund outreach programs in the community as they had in the past. Instead, they’ve had to divert money to pay their high operational costs. Determined to help, Richard Truman, Treasuer of the church, turned to Summit Natural Gas of Maine for help. “I had been reading the newspaper articles about Summit’s plans to install natural gas in the Kennebec Valley and I made a phone call to their office in Augusta and found out they would be coming to Gardiner. Shortly after that, I met with their staff about our options. During our discussions, they provided a valuable list of area contractors and HVAC professionals that could provide estimates and help the church make the switch to natural gas,” said Truman. That first phone call to Summit helped the church in more ways than one. After receiving the contractor bids, the vestry of the church voted to move forward and convert to natural gas, a decision that is expected to save the church at least $10,000 annually on their heating costs. The savings will come from the lower cost of natural gas, upgrades in equipment, new technology and increased efficiencies. “Our old heating system relied on the original cast iron boiler that was installed in 1964 to heat the large hall, while two forced hot air furnaces heated the church. In recent years it was costing the church $24,000 in heating costs per year. We had four 330-gallon tanks to store the fuel needed to run the systems. Before deciding to convert to natural gas, we also looked into other options ranging from solar to geothermal, but because there are several dynamics of our church that make it hard to heat, those options weren’t going to work. The team from Summit shared new ideas and technology that will minimize how much fuel need to be used. For example, the new cold-start boilers that don’t have to operate if the church isn’t being occupied. We will now be able to better allocate our heat because of the new technology,” said Truman. 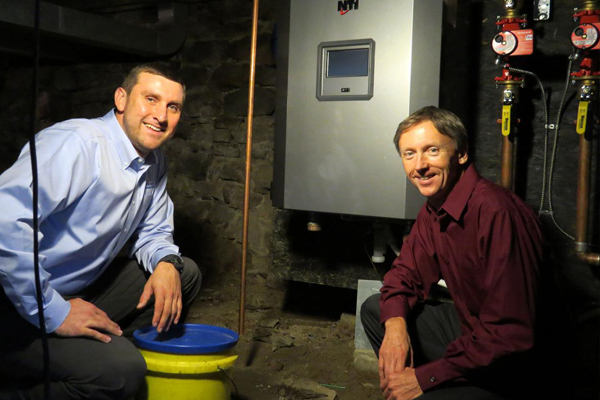 In addition to replacing the boiler, the church converted two hot-air furnaces and a commercial stove in the kitchen to natural gas. “We used to run the kitchen stove on propane, but once natural gas was installed it was a no brainer to convert that too. It’s great, we don’t have the huge propane tank outside anymore and we all know propane isn’t cheap,” said Truman. In addition to the savings that will come from switching to natural gas, church members are hoping it will again make the church a more attractive place for members of the community. “Natural gas has helped stabilize the church; it was clear that our expenses exceeded our income and switching to natural was the single most important thing we could do. With our new energy reduction plan, we will be able to allocate more funds for our community programs and help those in need,” said Truman. The church has also installed thermal blinds to hold in more heat during the winter months. With the help of Efficiency Maine, the church has also replaced all the lighting fixtures, providing better lighting quality, at a lower operating cost. The church hopes to continue making more energy efficient improvements in the future. In addition to Christ Church Episcopal, Summit Natural Gas of Maine is also providing natural gas service to residential and business customers in Gardiner, as well as Augusta, Fairfield, Hallowell, Madison and Waterville. In total, more than 2,000 residential customers have already signed up with Summit for natural gas service and to benefit from the efficiency rebates available.